At a workshop I attended years ago, a children’s book editor advised the writers to create characters “as real as spit”. A graphic illustration, for sure, but one that has stuck with me for over 20 years of writing for children. It’s not always easy to tell if you’ve created a character this real, is it? How do you know if your main character is believable? Or if he/she could walk off the pages of your story and live out an authentic kid life? For me, it often comes down to empathy and visualization. How completely is my heart engaged in this kid’s story? How well can I visualize the scar on his knee, his strivings, his sense of humor? How vividly can I imagine what it would be like to live in her family, go to her school, experience her wins and losses? In my new picture book, A Bike Like Sergio’s, Ruben longs to get a bike like his best friend’s. Even with his birthday around the corner, Ruben is certain his parents will not be able to afford such an extravagance. Standing in line at a local grocery store, Ruben sees a woman drop a dollar bill. Feeling frustrated by his bike-less state, he scoops up the dollar and shoves it in his pocket, without trying to return it to the woman. At home, he pulls the bill out of his pocket and discovers it is not one dollar, or five, or ten. It is one hundred dollars– enough for a bike like Sergio’s. What will he do? That question brought a boy to mind. A skinny, curly-haired, brown-eyed boy. A boy with a three little siblings, and a mom and dad with lots of love but stretched thin financially. I could see him. I could visualize his full-to-overflowing, kid-worn apartment, and the corner grocery he visited with his best friend. I could sense his longing. And I tried to tell his story, not to deliver a message, but to make a child with a similar longing feel understood. Once I had the loose bones of my character in place, I could get to work on the plot of his story. For me, a sense of the character is developed through the writing of the story, not in advance of the story with character sketches. For other writers, the character is fleshed out thoroughly in advance, and launched into the story. Personally, I like the mystery of letting a character unfold and not knowing exactly how he or she will respond to the plot around the corner. Mine your own life for succinct, personal details. Who were you as a kid? What made you belly laugh? What kept you awake at night? Or filled you with fury? Or made you nearly burst with pride? Why did you keep certain secrets? “We see from where we stand” is such a true adage, and we “write from where we stand” as well. Tune into the kids in your inner circle. These may be your own children, a particular student, a niece, nephew, or neighbor. Do your very best to understand these inner circle kids, the way they are wired, their light and their shadow. Imagine yourself in their shoes, going about their day, experiencing their joys and sorrows, capitalizing on their strengths, and dealing with their challenges. Let your affection for these kids fuel your imagination. And let that powerful, inspired imagination lead you right into a story! Collect and study examples of great characterization. (Mentor texts, anyone?) Some of the amazing examples on my shelf: The War that Saved My Life by Kimberly Brubaker Bradley, Echo by Pam Munoz Ryan, and Crenshaw by Katherine Applegate. For picture books, Wolfie the Bunny by Ame Dyckman, A Sick Day for Amos McGee by Philip C. Stead, Last Stop of Market Street (particularly the grandma) by Matt de la Pena. This is just a snippet–there are so many awesome books that do this well, and are just asking for you to parse out how the author has created unforgettable characters. Experiment with first person point of view. While there are limitations, first person POV can have a magical way of unleashing your own imagination, empathy, and visualization which will help you sink right down into your character, and unfold his story. We often swoon over a certain book because we love its main character. That main character has become as “real as spit” to us because of the intentional, intuitive way the author has fought to make that happen. And that fight is worth it! I am dazzled by the continuing inspiration and encouragement this writing and teaching community provides to so many, including me! Thank you, thank you! Maribeth Boelts is the Iowa author of 35 books for children, including Those Shoes, illustrated by Noah Z. Jones, and Happy Like Soccer, illustrated by Lauren Castillo. Her new Candlewick Press picture book, A Bike Like Sergio’s will be released September 2016, along with two Random House early readers, Pupunzel, and Ivy, the Fairy Dogmother. 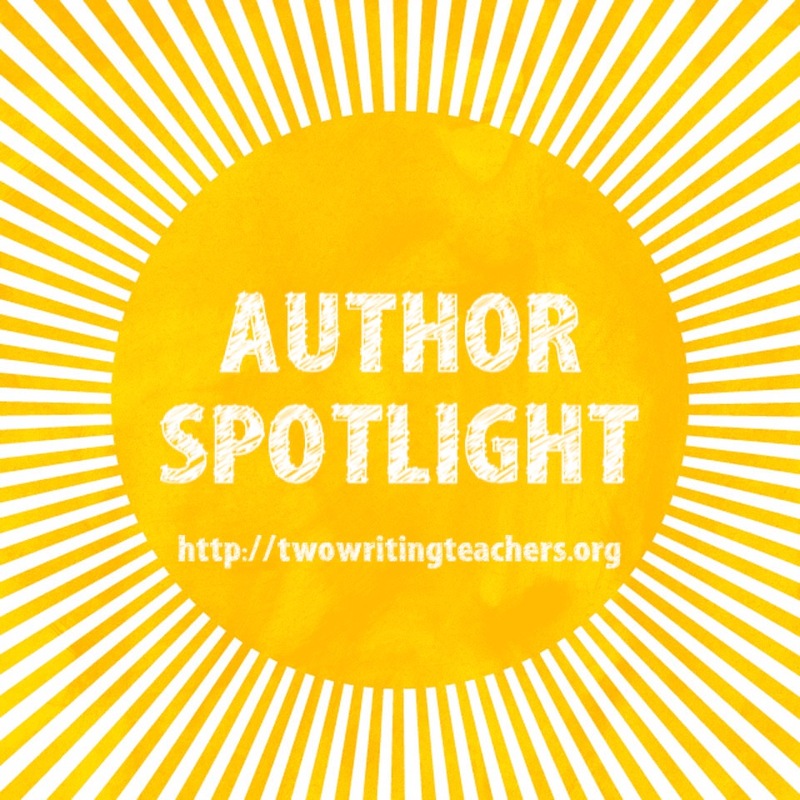 With a teaching background, Maribeth loves to present to and work with young writers throughout the United States. Contact: http://www.maribethboelts.com/. This giveaway is for three copies of A Bike Like Sergio’s. Many thanks to Candlewick Press for donating three copies (one book for three different readers) of Maribeth’s forthcoming book. For a chance to win this copy of A Bike Like Sergio’s, please leave a comment about this post by Saturday, June 4th at 11:59 p.m. EDT. We’ll use a random number generator to pick the winners, whose names will be announced at the bottom of this post, by Monday, June 6th. If you are the winner of the book, Stacey Shubitz will email you with the subject line of TWO WRITING TEACHERS – A BIKE LIKE SERGIO’S. Please respond to my e-mail with your mailing address within five days of receipt. Unfortunately, a new winner will be chosen if a response isn’t received within five days of the giveaway announcement. Thank you to everyone who left a comment on this post. 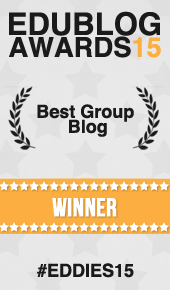 A special thank-you to Maribeth for taking the time to respond to so many readers’ comments! I used a random number generator and freegriffa’s commenter number came up. Therefore, she’ll receive a free copy of A Bike Like Sergio’s. I love the phrase “as real as spit”–and I bet my 5th graders will too! It was helpful to me as well! Good luck to you and your fifth graders! Like the idea of tuning into kids I know, thinking about their motivations. Thanks! You are welcome! The kids in our inner circles are a wealth of writing fodder! I can’t wait to try these suggestions for my own summer writing plans, and my teaching in the fall. Thank you!! How lucky your students are to have a teacher who has a writing life too! So many things in education – and life – come back to EMPATHY. I love your comment, and couldn’t agree more. Thank you for sharing such practical tips for developing authentic characters in the writing process. Being able to empathize with the character and truly visualizing what they are doing are such great indicators of that process. And the writer really cares about the characters, that has a way of transferring to the reader. Thank you, Yvonne! Love your ideas about character. I plan to try this on my own and have my students try it out as well. Thank you so much. Thank you! Wishing you a summer filled with your own creative, productive writing! Thank you! Planning to try out your suggestions this summer and then with my students! Hope all goes swimmingly well! Thanks! Thank you for the great writing tips! They are so valuable coming from such a great writer! Aw, thank you, Cathy. You all have no idea how much I admire teachers who are so committed to helping their students become better writers! Great tips for developing characters! I am going to share this with my 5th graders! Thank you! Aah! I don’t know what he did with the money! Now I’m off to find the book. I love your ideas to develop characters! Thanks, Kerry. Just like people, characters are infinitely interesting! My students love Those Shoes as they were able to connect it to their life and emotions. It helped their critical thinking and quality writing as well. I can’t wait to read A Bike Like Sergio’s to them! Thanks for using my book with your students– I’m touched that you’ve helped them connect with the story. Di love learning the back story of how a story develops and changes. It’s never a linear process, that’s for sure. I love hearing other authors’ backstories too! Great writing tips for creating authentic characters. Thanks! You’re so welcome! It was a wonderful opportunity! I really appreciated your ideas on how to develop characters that are as real as spit. I find the suggestion to mine your own life for personal details a great idea to help my first graders get characters with depth. The questions you presented as probes will be great to use to foster deeper character development. I can’t wait to try this. Your first graders are so lucky to have a teacher like you! We love Those Shoes! I would love to have a new book by Ms. Bolets. I’m so excited to read your new book! Thanks for your “real as spit” character tips. I am eager to share these with my 4th and 5th grade writing groups tomorrow! Ooo, 4th and 5th graders are the perfect age for understanding some of the complexities that help create more “spit-like” characters! : ) Good luck! Aw, thank you, Carrie! All the best to you and your students! I’ve been trying to better develop a character for a PB manuscript I’m writing. I’ve used some tools from SCBWI. However, this post is helping me too! Thank you for your sage advice, Maribeth. I appreciate it! That’s exciting, Stacey! You can do it! I’m a big fan of Happy Like Soccer after using it this year in the 2nd grade unit of study for reading. I’m looking forward to A Bike Like Sergio’s. Thanks for using “Happy Like Soccer” with your 2nd graders. Happy writing to them! What interesting tips from a favorite author! So much great advice here. I look forward to reading A Bike Like Sergio’s! Thanks, Maureen! I’m so appreciative of every reader! I will certainly remember the phrase to create characters as real as spit! Love the focus on empathy in character development. In my school visits, we’ve been talking a lot about empathy, and I’ve been amazed how kids can both recognize it and put its definition into words. Thanks, Susan! Look forward to many minilessons with this book…thanks! Wishing you every success with your future mini-lessons! This book sounds fantastic! I loved the tips and the mentor text ideas for creating memorable characters. I want to use this book with my students! I need this book, an incredible launch for narrative writing next fall. I love the fact that she gets right to the point in the title, it doesn’t get any clearer than SPIT! It sure stuck with me, and I hope it sticks with your students too. Already thinking next fall–I love it! I love the book those shoes. Can’t wait to read this new one. What a wonderful way to think of starting the year in the fall, focusing on believable/true characters with students of all ages, characters that are “as real as spit!” Students will love the statement as well as mining through their own lives to create believable characters. I can hardly wait to read Ms Boelts new book as well. I’ve loved using “Those Shoes” with students! It’s so inspiring to read that you’re already planning your writing launch in the fall. There are so many books with truly believable characters, and it’s infinitely interesting to try to “crack the code” on how the author has created them! Good luck with your mini lessons, Heidi! The book sounds like a great addition to any classroom library and I love having one more example to share with students about a “real” author who had a story in mind, but then scrapped almost all of it because it just wasn’t working. Sometimes stories are locked tight, and a writer has to keep prying open the lid with lots of different versions before one opens the story he or she really wants to tell. It can be a frustrating process, but I like Anne Lamott’s philosophy that all writing “feeds the stream”! What a great post! I am inspired to try something different with my writing, and that is a great position to teach from! I look forward to reading the book, A Bike Like Sergio’s! Oooo…happy writing to you as you experiment!! Thanks! What great ideas that can easily be transferred into kid-friendly mini-lessons! Much thanks! I love your confident word “easily”! Thanks, Morgan!! Great ideas on characters! Can’t wait to read this book!! I appreciate your comment, Tamera! The lesson of Sergio’s bike is so important for my fifth graders as they go off to middle school and more independent decision making. You’re so right. The stakes get bigger as that independence grows! Thanks for introducing me to another great mentor text to add to my classroom collection! Thanks yo very much! I’m honored to have my book in your collection! I love this post! It inspires me to try something different with my own work, which is exactly the right way to present ideas to students! I look forward to reading this book! So true. And you’ll be able to lend your own insight to this character-developing process based on your experience! I love reading about the process different writers go through as they create! Thanks for this window into your work. Me too! We’re all so different in how we express ourselves– the variety of approaches keeps it ever interesting. What a great post! I am inspired to work differently with my own work- which is exactly the right way to present ideas to students! I will be looking forward to reading this book. Good luck to you as you experiment with your own writing, Mary! This is such great advice! Mrs Boelts visited my school this year and shared this same advice with our students and I saw them apply it to their own writing and it made a difference. I can’t wait to read her new book! Hi Alexis! I loved my time at Bellerive, and am happy your students found this info helpful! Great tips for creating authentic characters! Anxious to share with students and teachers! I appreciate your enthusiasm, Joni! Happy writing! That is a beautiful insight– and so very true. Wouldn’t the world be a better place if we all got to know each other better?! I appreciate your connecting this with character development. I love the reminder to think about yourself as a child. What fantastic stories we all have! I feel inspired to write now – thinking about the story (or stories) I really want to tell. I agree! Remember those stories, and keep writing! Sounds like a great book. One that I think many children will identify with. Thanks for sharing the tips, looking forward to trying them in the class. Wishing your students a lifetime of productive writing. Thanks! Thanks for this great post! I love Those Shoes and am excited to read this new book and see what happens w Ruben! Ruben ends up deep-down proud, even without his bike. When I share this book with students, they all want to know if Ruben eventually gets his bike, and I tell them YES, I believe he does. Oh, the relief! Would love to add this to my mentor text collection! Honored to be included in your collection! The question you ask yourself, “What is the story you really want to tell?” reminds me of the question Carl Anderson says he asks himself and other writers, “What are you really trying to say?” I’ve thought of that often since hearing him say it last summer at TC. And every time I ask myself that question and go back to writing with that question at the front of my mind, my writing becomes more authentic. I love your list of mentor texts for studying characterization. And your tips are great. This author spotlight series is terrific. It’s such a galvanizing question, isn’t it? And you’re right, it does lead to more authenticity when we both ponder it, and respond to it through writing. Love hearing how you tried a certain way & then scrapped the whole idea & I don’t think you worry too much about talking to yourself. I certainly don’t. It just gets embarrassing if I think out loud! I’m working on a story right now & you are inspiring me to keep going. In fact, I might try to make my Miss Silkie, the chicken, & Arnold, the pig, as real a spit, right now! How could Silkie and Arnold be anything else than real as spit?! Love it, Stefanie. I have a feeling your sense of humor will shine right through your story! I would love to use this book as we write our own realistic fiction. There is a great life lesson here that the kids could really relate to. I love that we can have fun fiction that has a positive impact on life. Thanks for sharing. Would love to win the book! Thank you for giving the green light to break away from the almost-mandatory, pre-writing character sketch! I’m eager to know the rest of Ruben’s saga. Pre-writing character sketches give me the shivers, but they do work for other writers. Thanks for commenting, Mona, and happy writing to you! I love Maribeth’s books, and so do second graders. I was stopped by the first line–characters as real as spit–but that line says a lot in so little. I also think it’s interesting that Maribeth tried to write this with animal characters first. Hi Maribeth! They’re aren’t too many of us around, are there?! Love it – “as real as spit” is language that will make sense to most of our kids. Can’t wait for this book to arrive! It sure stuck with me too! Thank you! I always appreciate a list of great mentor texts, this time for characterization. Thank you! WILL have this book in my classroom come September (sitting next to beloved Jeremy’s book, Those Shoes!) And would love to win it!! Oh, I love the visual of Jeremy and Ruben hanging out together! Thanks, Sally! And I love this feeling I have right now reading your comment! The amazing author who created Jeremy wrote to ME! Keep creating rich characters in books. And know that GREAT book discussions are occurring in my classroom to help my students figure out how best to live using examples like Jeremy (and soon, Ruben!). This is great advice! Picturing & imagining the main character fully would add depth to the story. There’s something so powerful about taking the time to deeply visualize a character, and feeling empathetic toward him/her. Would love to use this book with my class. Children need books about real problems that do not sound “teachy”. 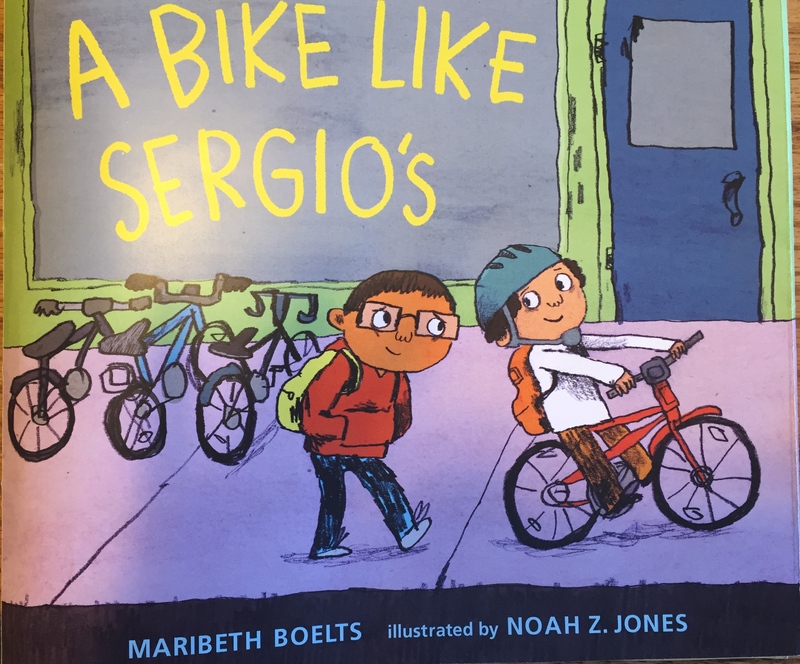 I love Maribeth’s other books and I can’t wait to read this book, A Bike Like Sergio’s! That’s a tricky balance I take seriously. Not to preach or teach, but deliver a real story. Thanks for your encouragement! This post fits so nicely in with the series writing we’re doing in my classroom! I’m sure I’ll be referencing it when I work with my students this week. Thanks! That’s wonderful! Wishing your students creative, productive writing experiences!